After many visits to Lanai, we’ve had a chance to dine at almost every restaurant on the entire island. For such a small island, Lanai’s chefs sure do cook up some great food. From local ono grindz to haute cuisine, Lanai truly has it all. I’ll share our favorite places to dine in Lanai organized by meal. What a beautiful place to start the day with a yummy breakfast. We usually opt for the bountiful breakfast buffet, but their a la carte menu is a good option, too. We’ve probably had breakfast here close to two dozen times and it’s always delicious, but the view, oh the view of Hulopoe Bay is tremendous. One Forty is located in Manele at the Four Seasons resort. They’re open for breakfast and dinner. The Terrace offers very tasty gourmet breakfasts with views of the Lodge’s peaceful gardens and grounds. They’re open for breakfast, lunch and dinner. (We love the Terrace for dinner, too!) The Terrace is located at the magnificent Great Hall in Koele at the Four Seasons Lodge. This little coffee and treat shop is Lanai’s version of Starbucks. It’s a great place to sip a morning cup of joe and have a pastry while soaking in the laidback Lanai vibe. Coffee Works is located in Lanai City on Ilima Avenue, just a block away from Dole Square. Locals love the fresh baked pastries and turn overs at Blue Ginger Cafe. The earlier you get there the better. This Lanai City restaurant is open every day for breakfast and lunch. You can’t get much more local that Canoes if you’re looking for local ono grindz. Canoes is on 7th Street in Lanai City. They’re open from 6am to 1pm. Canoes serves both breakfast and lunch, but you can get breakfast anytime they’re open. Take out is available. If you need a quick, filling snack on the go, I recommend their Spam Musubi. Canoes offers indoor and outdoor seating. They serve everything from omelets and pancakes to plate lunches and hamburgers. Prices are relatively reasonable. If you’re on Lanai for a Saturday morning, make plans to go to the weekly farmers market at Dole Park. At the market, you can find homemade goodies and freshly prepared malasadas as well as fresh fruits. We absolutely love having lunch at The Challenge Clubhouse. Love it! The food is always excellent and the view is even more delicious. We like to start with the homemade salt and pepper potato chips with Maui onion dip. The Prawn BLT is a favorite along with the Makai (seafood) Salad with lilikoi dressing. They always have a special fruit-flavored lemonade for the day. The Challenge Clubhouse is located at The Challenge Golf Course. An on-demand shuttle service is provided from the lobby of the Four Seasons Resort at Manele. They’re only open for lunch. See the following short video Andy took to show you the outstanding view from this restaurant. (Email subscribers: click here to access the video.) Please don’t miss this place! I mentioned Canoes in the breakfast section. It’s a great place for lunch with a true local flavor. 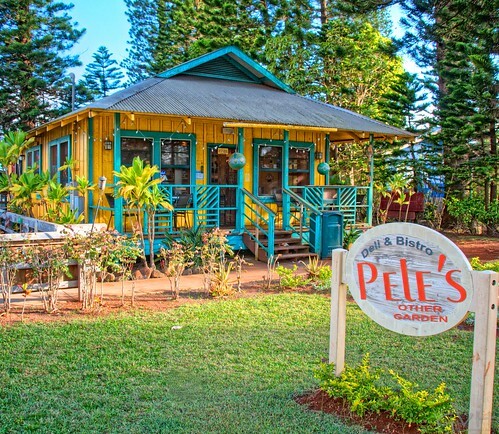 If you want a deli sandwich for a picnic lunch, Pele’s is a great lunch option. They’re located on 8th Street, across from Dole Park. This restaurant is next door to Canoes on 7th Street in Lanai City. They told me they were famous for their teriyaki chicken. I thought it was quite tasty, though it did have a bit too much fat for my liking. Blue Ginger is also known for their mahi mahi sandwich. I really liked their ono sandwich. Blue Ginger is open for breakfast, lunch and dinner. Nobu Lanai is journey worthy — I’d fly the 20+ hours roundtrip from North Carolina just to dine at Nobu Lanai. It’s that good. In our opinion, it’s definitely one of the best restaurants in all of Hawaii. Nobu Lanai is more than a restaurant. It’s more like a journey for your tastebuds. The highly knowledgable servers help you plan your dining experience for what I’d describe as Japanese, tapas-like dishes. I’m not a huge sushi fan, but Andy is. Our servers listened to our preferences and found the perfect dishes that satisfied both our tastes. Nobu is also quite romantic. We love the low tables with sofa-style seating by the railing. Nobu is located at Four Seasons Lanai at Manele Bay. Reservations are recommended. 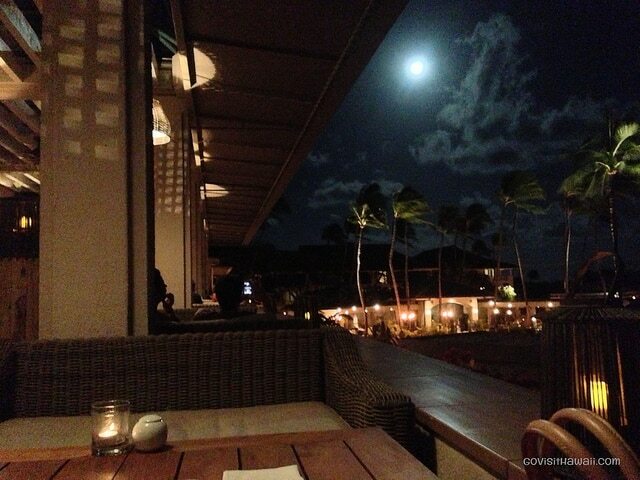 Dining at Nobu Lanai on a romantic moonlit night. I think I could dine at The Dining Room every evening and never grow tired of it. This award-winning restaurant offers both an a la carte and tasting menu options. The Dining Room offers an intimate atmosphere with a cozy fireplace. We highly recommend the Dining Room. It’s located at the Four Seasons Lodge at Koele. See our photo collection from the Dining Room. Reservations are recommended. We recommend requesting a table by the window or by the fireplace at The Dining Room. Another not-to-be-missed Lanai restaurant is Lanai City Grille in Lanai City. If you’re on Lanai on a Friday night, you must go to the Lanai City Grille as they have live music that’s very popular with locals and visitors. Part of the Lanai City Grille menu was designed by Chef Bev Gannon. I first got a taste for her American and Pacific Rim culinary designs at Maui’s Haliimaile General Store. We have always enjoyed everything we’ve ordered at Lanai City Grille. The appetizers and entrees are excellent, but you must save room for dessert. Toasted Coconut Cream Pie or Warm Chocolate Chip Cookie with Vanilla Bean Ice Cream, anyone? Lanai City Grille is located in Hotel Lanai in the heart of Lanai City. They’re open for dinner only, Wednesday through Sunday. Reservations are recommended. We found ourselves going back to the Terrace twice for dinner on our recent visit. We also found ourselves cleaning our plates as everything was delish! One Forty, located at the Four Seasons in Manele Bay, serves amazing steaks and seafood. One Forty gets its name from two interesting facts — Lanai has a 140 mile square radius and a medium steak is cooked to perfection at 140 degrees. One of our friends who is a steak connisiuer told us he had the best steak of his life at One Forty. This restaurant is open for breakfast and dinner. When we are just in the mood for a drink and some pupus (appetizers), we love to grab an oceanview table by the railings at the The Sports Bar. Usually there’s live music playing in this relaxed, yet elegant lounge. The Sports Bar is located at the Four Seasons Resort at Manele. I think it’s practically impossible to go to the Four Seasons Lodge at Koele and not be drawn to the Great Hall. The Great Hall features soaring ceilings, giant fireplaces and oversized seating that beacons you to soak yourself into the comfortable cushions. At the Great Hall, you can have afternoon tea, hot chocolate, or an evening cocktail while listening to live entertainment. Unfortunately, the the Lanai Ohana Poke Market has been closed when we’ve visited, but we’ve certainly heard how delicious it is. Many locals recommend it highly, saying that it’s the best poke in all of Hawaii. Lanai Ohana Poke Market is located at 834 A Gay Street, just a hop, skip and a jump from Dole Park. If you’ve been to Lanai, please share your favorite dining experiences? What restaurants do you recommend? Thank you, Nancy & Shawn! For such a small island, they really do know how to make good food. I agree on the Challenge at Manele Clubhouse, though am sad to hear it’s only lunch now. I had my best dinner–ever–up there. We were handed keychain flashlights on the way in to read the menu under the stars. I tried my first foie gras there as well. It was magical. I lived on Lana’i ten years ago when Coffee Works just opened. Mornings were great for coffee, then I’d run over after a long day teaching for bubble pearl tea. The Blue Ginger was my haunt though. They make the best pastries in town!! The locals love it there, so I advise people to slow down & listen to the stories being shared about Lana’i you won’t find in the books. On the morning of Sept 11, 2001, I got to the Blue Ginger right when it opened, sat at a big table of locals drinking my coffee and listened to an old Japanese man as he compared the morning’s events to his memory of watching “planes with a giant red dot” flying low over Lana’i en route to attack Pearl Harbor. It was stunning. Happier memories include spending time eating heavy pupus and drinks at Hotel Lana’i and at Manele. It can be very expensive to eat there at times, so pupus were an awesome option. Loved checking out live music at Manele, especially because you never know who will drop in that night. One singer we heard had a bunch of hits in the 70s, loved singing at the piano and visiting. Please don’t overlook the three grocery stores around Dole Park, as they have good eats too!! Richard’s carries a great selection of wine & alcohol, along with several gourmet foods & local grinds. Many times, we loaded up a vehicle with food, etc., and went hele through the caldera down to Hulopoe Beach for a long night of BBQ. Often it would get so dark you couldn’t see your hand in front of your face!! Beware of the kiawe thorns though between the parking lot & the beach. Very painful to step on those! Oh, how I wish the Challenge at Manele Clubhouse served dinner! That must have been amazing to dine under a sky full of stars. Your 9/11 experience sounds like a one of a kind to get to hear that comparison. Gives me chills to imagine that sight of planes with giant red dots flying over Lanai on that other fateful day. Thanks for the grocery store suggestions. Will definitely give those a try next time. Thanks again for sharing your Lana’i memories with us! I am hungry for good food! A PB & J isn’t going to cut it now! Man those sound good. Enjoyed Laurie’s trip down memory lane as well! Mahalo Janet!! Hope you can get to Lana’i soon!! Thanks for all the epicurean recommendations. Will definitely try most if not all listed above during our stay on the island next week. Thank Sheila! Bon appetit, Jim. Hope you enjoy. Please come back to comment on your thoughts of Lanai dining.